George Washington made his Christmas Day trip across the Delaware River — with considerably better weather than the first time. Re-enactors playing Washington and his troops crossed the Delaware River in the 62nd re-enactment of Washington’s daring Christmas 1776 crossing of the river — the trek that turned the tide of the Revolutionary War — between Washington Crossing, Pennsylvania, and Titusville, New Jersey, on Thursday afternoon. As opposed to the severe weather — including snow and freezing temperatures — that Washington and his troops faced in 1776, the annual re-enactment was done under mostly sunny skies and 50-degree temperatures. 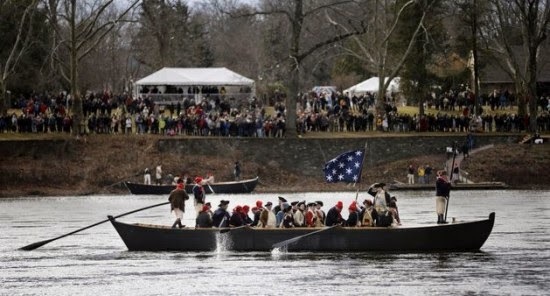 Hundreds of people lined both sides of the river to watch as re-enactors used four replica Durham boats like the ones Washington’s troops used. The actor playing Washington boarded the final boat, and a cannon blasted as he reached the other side. Thirty Hessians were killed, and two Continental soldiers froze to death on the march, but none died in battle.